From Auckland we headed to Taupo, with a stop at the Waitomo Glowworm Caves to break up the long drive. 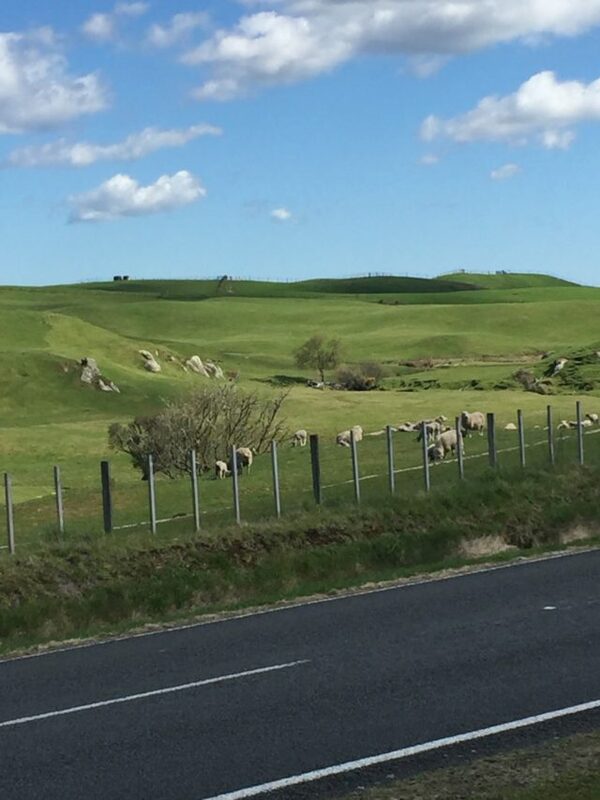 We chose not to drive ourselves, so we could enjoy the scenery along the way and spare the New Zealanders the threat of yet another foreigner trying to navigate on the left side of the road. This is typical of the views from the car. Our driver Duncan educated us about his country as we drove south through beautifully green rolling farmlands to Waitomo. The weather gods continued to shine on us, giving us a sunny day in the 60s for our trip.Some random facts: Of NZ’s 4.6 million people, 80% live on the North Island and about 1.3 million are in the Auckland area. The average house price is $1 mil in the greater Auckland area, and it has more than doubled in past 5 years. All universities in NZ are public, so higher education is widely available. Professional schools such as medicine and dentistry, however, are costly. Dairy is the largest industry, along with timber and fishing. During the recent elections, the main issues were immigration and health care. Sound familiar? Their new prime minister is a 37 year old woman who only recently became head of the Labour Party (more like our Democratic Party), so no one is sure what to expect. The economy has been strong for the past nine years under the National Party (the conservatives). Neither party won a majority in the recent elections, so the two small parties (New Zealand First and the Greens–their names are self-explanatory) decided the outcome by aligning themselves with Labour after seeing which side offered them more. Because the election took a long time to finalize, this was big news. Duncan noted that the Labour and National parties are closer together in their views than our Democrats and Republicans. About ⅔ of all electricity in NZ is generated by renewable energy sources: Geothermal and hydro account for about 30% each, with wind contributing another 10. Given the number of geothermal areas we saw later in our trip and the network of rivers and lots of rainfall, this wasn’t surprising. After several hours we arrived at Waitomo. Wai in Maori means water; tomo means hole or shaft. A Maori chief discovered the caves in 1887, along with an English surveyor. They explored them on a raft using candles to light their way. Soon after, the chief and his wife began guiding visitors through the caves. In 1904 the government assumed responsibility for running the caves, which grew in popularity. Even Queen Elizabeth II visited in 1953, soon after she became queen. You can see her photo in the information placard. In 1990 the government returned the Waitomo Glowworm Caves to the descendants of the original Maori owners, many of whom work at the caves today. Several government agencies partner with the Maoris to preserve the caves. From Waitomo we passed through Te Kuiti, which claims it is the sheep sheering capital of the world and has this statue to “prove” it. After another two hours’ drive we arrived at Lake Taupo, New Zealand’s largest and the second largest freshwater lake in Oceania. It’s 40 miles long, 17 miles wide, and has an average depth of about 300 feet, as deep as 900. We had a spectacular view of the lake and snow-capped mountains, as well as lovely views of Huka Falls. Late afternoon we arrived at our day’s destination, Huka Lodge–oh, my! This Relais & Chateaux property is set on the banks of the Waikato River and Huka Falls. A more serene and gorgeous location is hard to imagine. We had some unusual visitors arrive on our patio, coming right up to the door. The lodge manager had told us that the ducks we saw on the pond loved to surprise the guests. And it we’d opened the patio doors, they would have made themselves right at home in the room–and probably left us a not so welcome gift before leaving! For dinner the Lodge sets up tables for each party throughout the lodge and on the grounds. Our first night we dined on the patio outside the main lounge, a lovely spot with a fireplace. The food was exquisite, and tasted as good as it looked. Unfortunately I forgot to take pictures of anything but the main course, which was lamb (of course!). And if a five course meal wasn’t enough, after dinner guests gathered in the lounge for cheeses, petit fours, and after dinner drinks! The perfect end to a long but lovely day. Cheers! All sounds fabulous, especially the lodge and Mr. Fussy looks soooo happy!! He was, indeed! One of the benefits of not doing a cruise was staying at such incredible places. And there are more to come! I love the pics! Your narrating style is awesome! I will follow your blog! bookmarked!